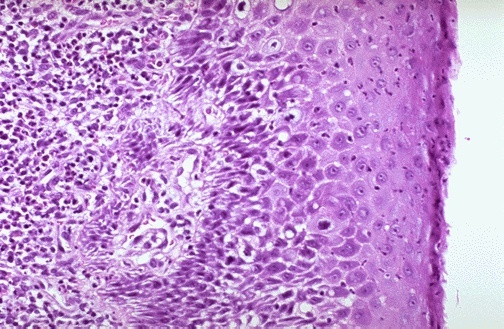 Acute esophagitis is manifested here by increased neutrophils in the submucosa as well as neutrophils infiltrating into the squamous mucosa at the right. The acute inflammation can be caused by infections, ingestion of irritative chemicals, drugs such as NSAIDS, chemotherapy, and radiation. Question: What are clinical features of acute esophagitis? Answer There can be difficulty swallowing, termed dysphagia. There can be pain with swallowing, termed odynophagia.